Why should you consider becoming an Interstate All Battery Center franchise owner? If this winning formula of strong corporate culture, proven track record and untapped market potential sounds like the business opportunity you're looking for, we're interested in talking to you. This advertisement does not constitute a franchise offering. An offering may be made by Interstate All Battery Center only after your receipt of the Franchise Disclosure Document, which is filed with certain states. A copy of the Franchise Disclosure Document may be obtained through contacting Kevin Hogan at Interstate All Battery Center Franchising, 17400 Northwest Freeway, Houston, TX 77040. Minnesota franchise registration number F-5119. 1 The average sales total of $991,477 is based on operating results for our 14 free-standing franchised centers open for our 12-month fiscal year 2008, during which gross sales for those centers ranged from $467,866 to $1,469,738. Of the 14 centers, 6 centers or 43% achieved gross sales exceeding the average. See our Uniform Franchise Offering Circular for more details. Your business' gross sales may differ and there is no assurance that your business will attain the average sales shown here. 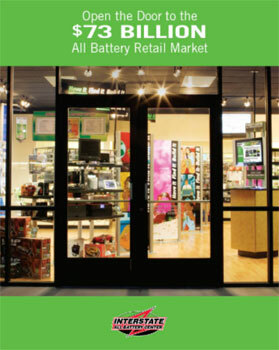 Click on Request Information for FREE info on how to open a Interstate Batteries franchise today! Please Note: This Interstate Batteries franchise opportunity and other franchise business opportunities, businesses and franchises for sale on this web site are not to be considered as an "offering", "franchise offering", suggestion or recommendation by Franchise Leader™. This advertisement depends entirely on the truthfulness of the information provided by our advertisers which includes, but is not limited to, franchisers, franchise brokers, franchise consultants and business brokers. Franchise Leader™ recommends that you consult a lawyer, financial consultant, accountant or professional advisor before buying a franchise or business opportunity or any type of business. By using this form or any part of our website, you have agreed to all terms and conditions of Franchise Leader™. Please review our Terms & Conditions for more information.